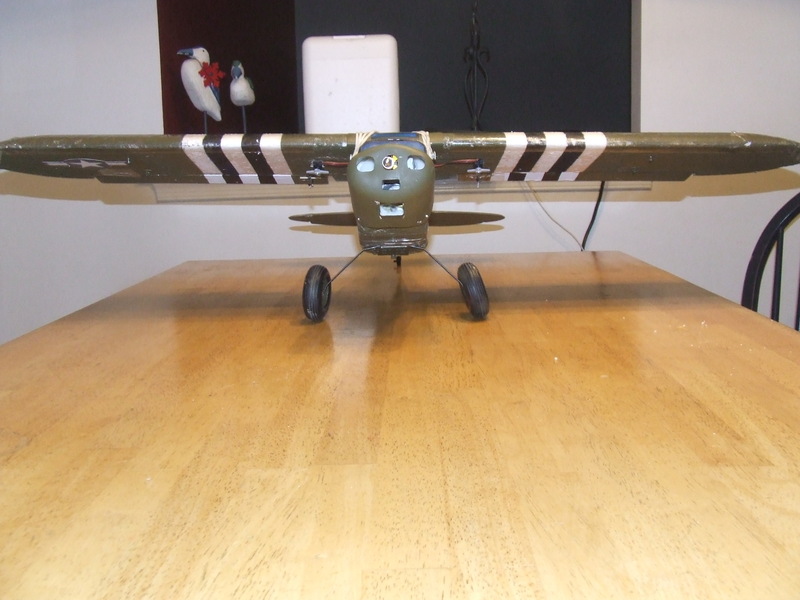 Show off your HZ Super Cub! Whether its stock or modified, show us what you have! Here is my Super Cub. I bought the plane last spring (March or April), and taught myself to fly on it. No simulator, no ACT (Always Crash Technology). The Super Cub is an amazing airplane! I have flaperons programmed in my Turnigy 9x. These are 13"x1.75", made from 1/4" balsa sanded and tapered to a nice shape. 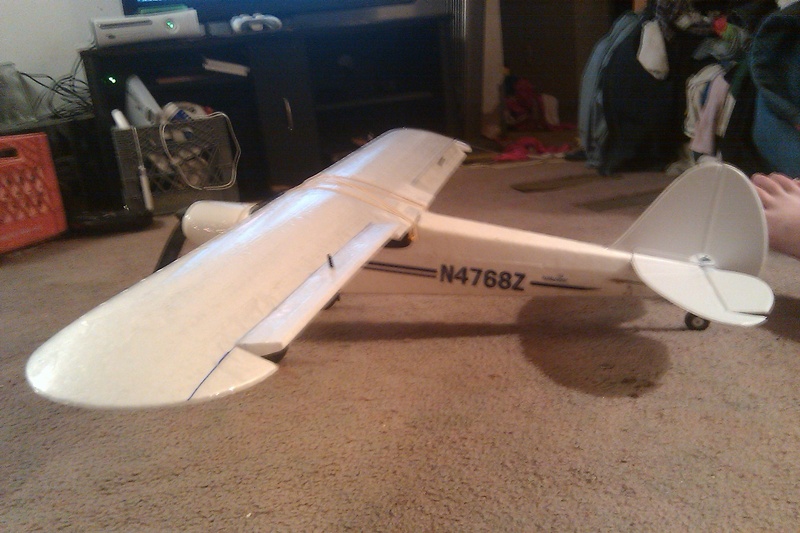 I removed the center portion of the wing and glued back together with no dihedral. A 0.405" dia woven carbon fiber tube provides reinforcement. I LOVE this airplane! While it is not the fastest or most powerful in my hanger, she is a solid work horse and A LOT of fun! Show us yours! Mine, doing it's thing. Flitetest style bombdrop cost about three bucks to make. Yep- I run a 10x6GWSDD prop. This plane is no longer a trainer. Wayyyy fassssst. It hauls three nerf footballs and those big wheels and the 2200 battery as if they were not there. This is a fun plane to fly. Hand launch or ROG straight to unlimited verical. I like the upper one because it has its own design. Well done! Here she is. The best bash plane ever invented. Fully taped wing so no need for the struts. 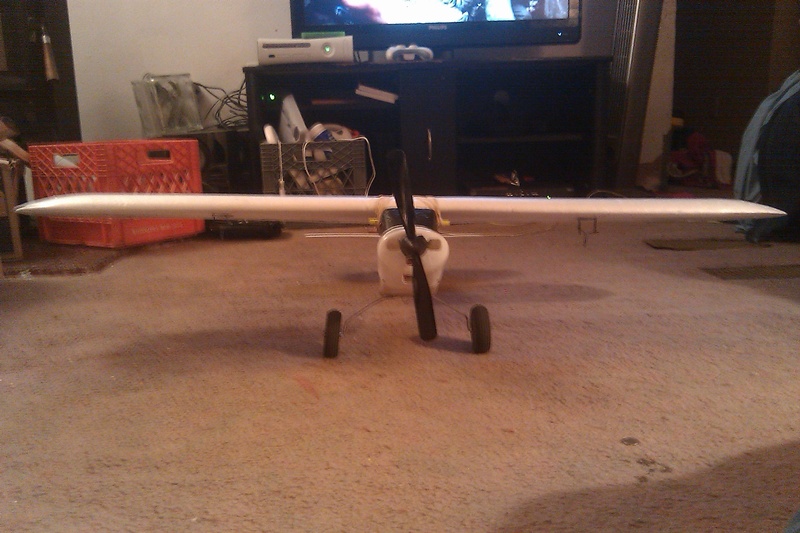 Hand bent landing gear to hold 3" wheels. A series of splash landings from flying on floats in waaaay to much wind resulted in shorted electronics. That led to the following additions. Orange Rx 6 channel receiver. Flaps, mixed with ailerons to function as full length ailerons until flaps are activated. Stronger tail setup. 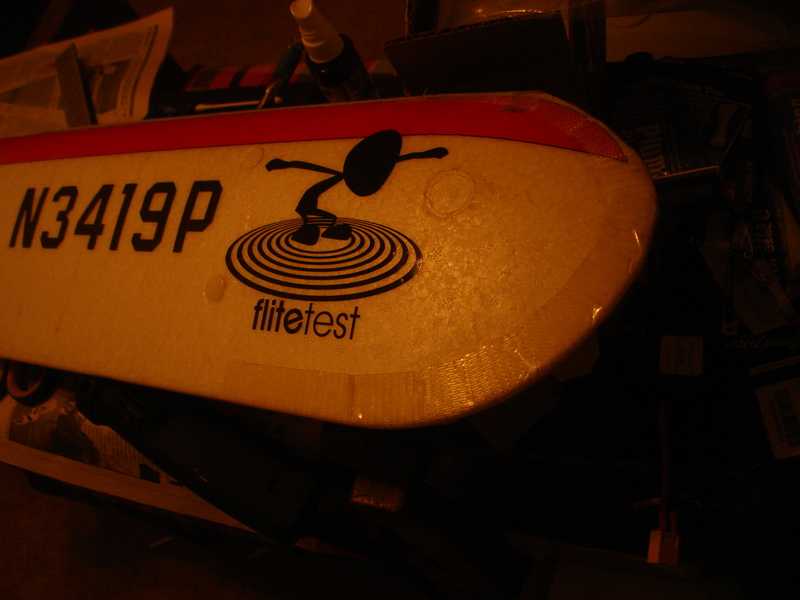 Stock tail fluttesr to destruction at speeds attainable with brushless setup. Funny to watch though lol. I love the paint job. That's an awesome looking plane. Isn't it awesome power With the 480, I can hover it with the floats on. It takes off the water in less than three feet now. Unlimited vertical with floats on even. Plus with a 2200 battery I can fly for what seems like forever. 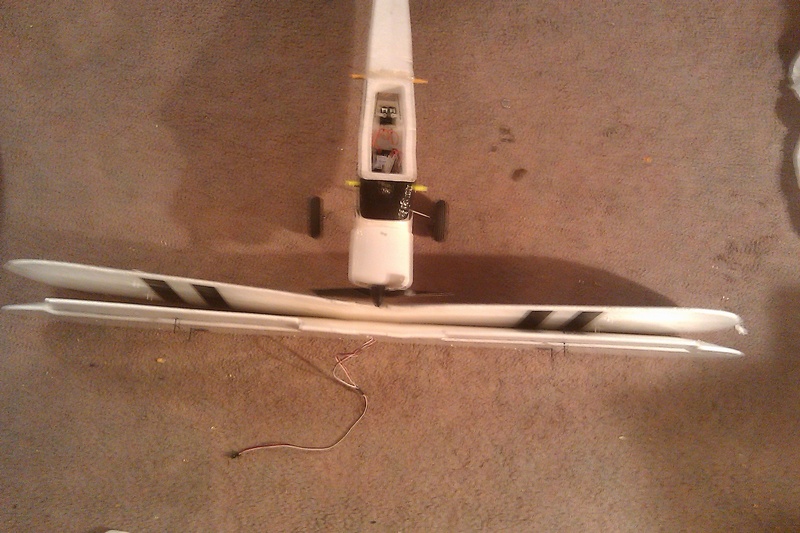 Talk about speed, it literally goes so fast that it rips the foam tail apart. Best mod I ever did. Went from being bored with it to now it's one of my favorite planes again. Yes! Not only fun, but other people get a kick out of it too. If they are flyers, they wanna know what motor is in it. If they don't fly, they get a kick out of me dropping nerf bombs on some of the other guys in the club. 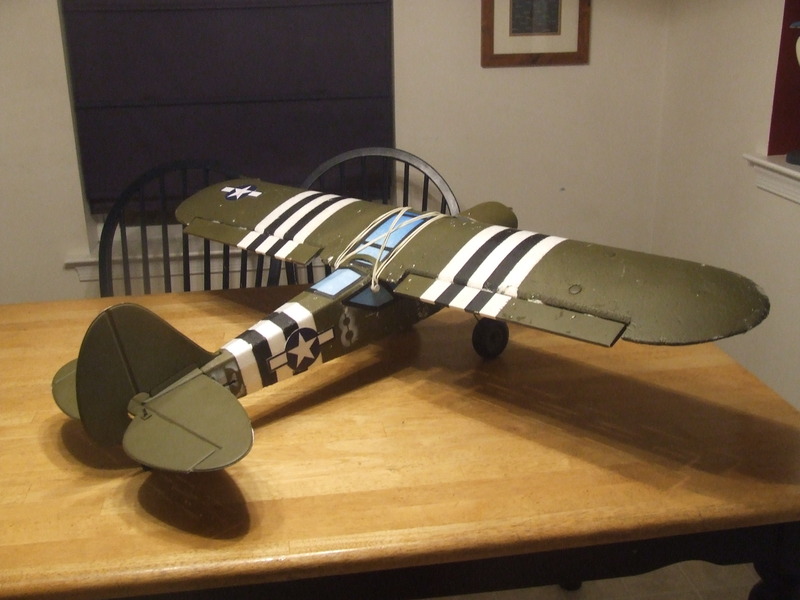 This plane quickly went from a cool project to one of my favorite planes! Thanks, anans and Ak! I am happy with the way it came out, even though it isn't finished. 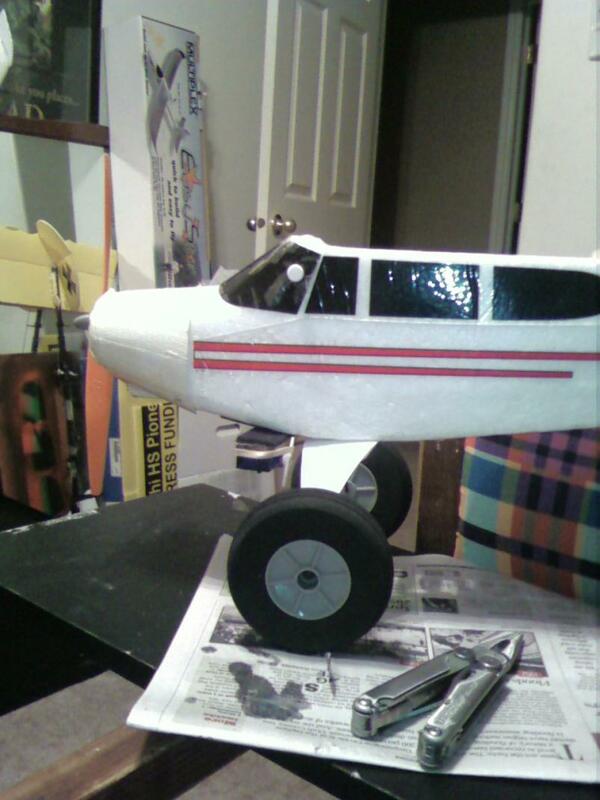 It needs stenciling on the tail and the flying surfaces need that "scalloped" green around the perimeter. I really like the way the "glass" turned out. I stole a picture of clear blue sky off the internet and printed it on overhead transparency film. The gradient of blue gives a nice effect. I'm not sure what is up with the performance of mine, lately. The APC 8x4E props I've ordered from HeadsUpRC.com seemed to give MUCH better performance than the ones I have bought from my LHS. While the packaging is labled 8x4E, the props are stamped with 8x4, which makes me wonder if they truly are 8x4's. I've broken all of my HeadsUp props. Teach- Really? an 8x4? Sounds like you are under propped? What motor are you running? 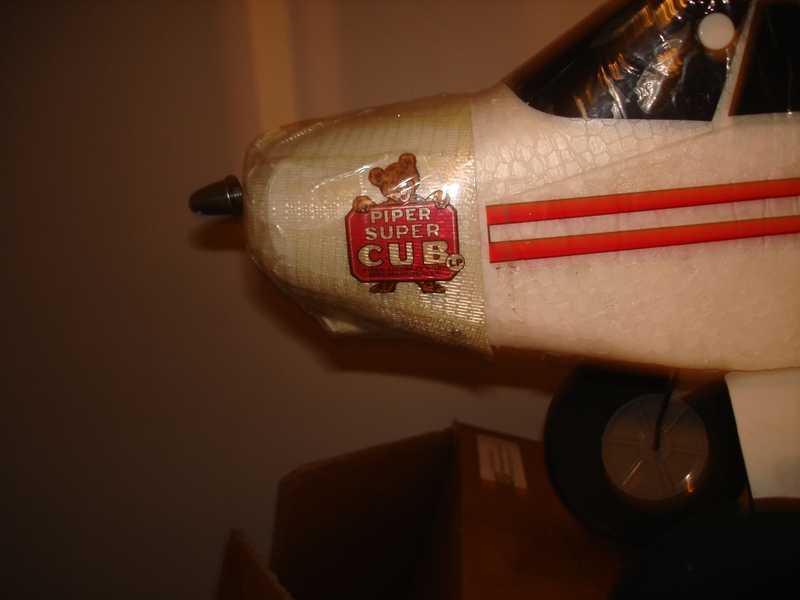 The cub likes big props, probably has a lot to do with the frontal surface presented by the cowling. The motor is 1200 kv. I'd love to be able to tell you the amps I'm drawing, but I don't have a watt meter (hanging my head in shame). 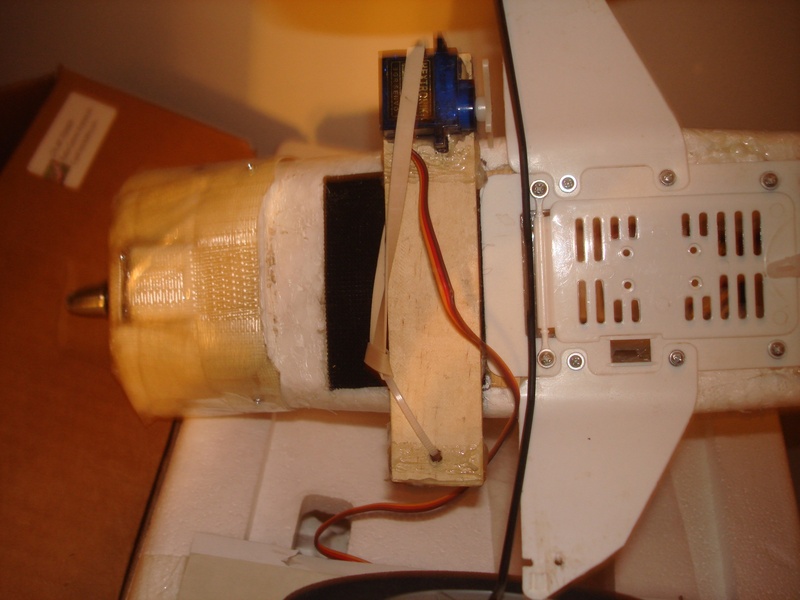 I do know the 8x4e motors I ordered from HURC resulted in a climb rate that bugged my eyes out and crazy speed. But, that was before I had any other frame of reference. Now, I have a Wild Hawk that climbs vertically until it is out of TX range. 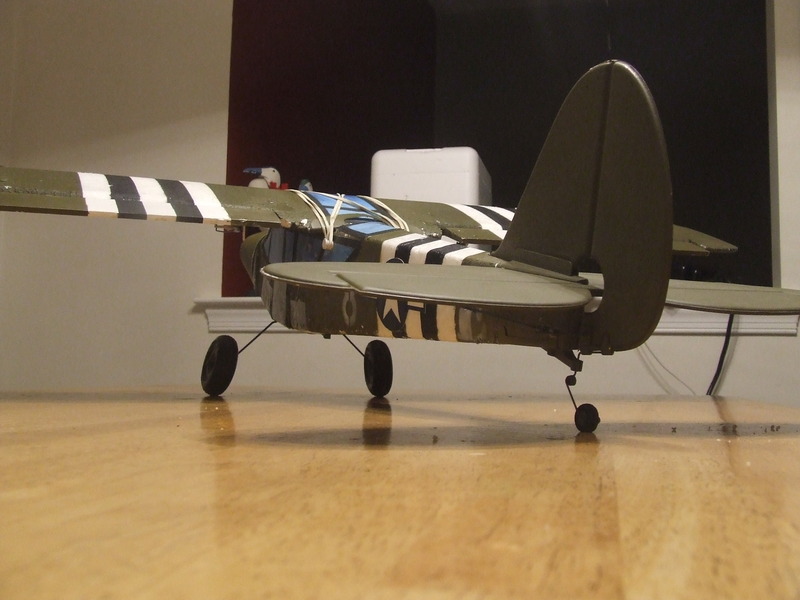 I have an 800 mm Spitfire that is fast and tiny. And I've flown a couple of edf's that are fast, small and a total handful. The cub, even at its wildest, seems sedate in comparison. But, I love this airplane! Even when it seems "slow," it will turn, literally, as if the wing is fixed in space. It will land like a Harrier with a 10 mph headwind. Snap rolls are beautiful. The large rudder surface makes hammerheads so easy. A hammerhead is only a work of art when the plane is almost at 0 airspeed. Any plane can "walk" through a hammerhead. The huge rudder of the cub will throw the nose around with very little airspeed. Horizon Hobby has the "best airplane ever," with the SC in my opinion. If a 3 channel turns you off, just imagine an airplane that you can load down with "ordinance," whatever you want that to be. Bomb drops are a stock add-on. Air to air combat is a stock add on. Want to fly off water? Well, stock floats are only $24.95. And we haven't even modified the stock airplane, yet! 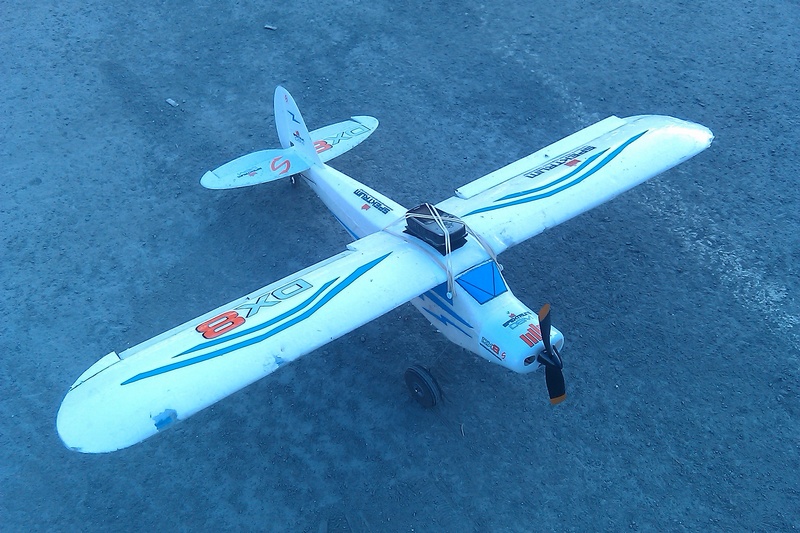 This is one flexible RC airplane. IMHO-the best airplane ever! Buy one. If you know how to fly, modify it to your heart's content! If you are new to RC, Buy one! I taught myself to fly on this plane. It is gentle, forgiving, while remaining responsive. I am very happy with my HZ SC! +1 for Best Plane ever. The adaptability of this airframe is amazing. I should hang my head in shame a little too. I have a watt meter but haven't even put it on the cub to see what I'm doing. If you do decide to put ailerons in it, buy another wing to start with. That way if you want to let someone new fly as a 3 channel you can throw the old wing on. Also, if you go ailerons, you'll really want to straighten the wing out. It gives it any amazing roll rate. This requires no cutting. 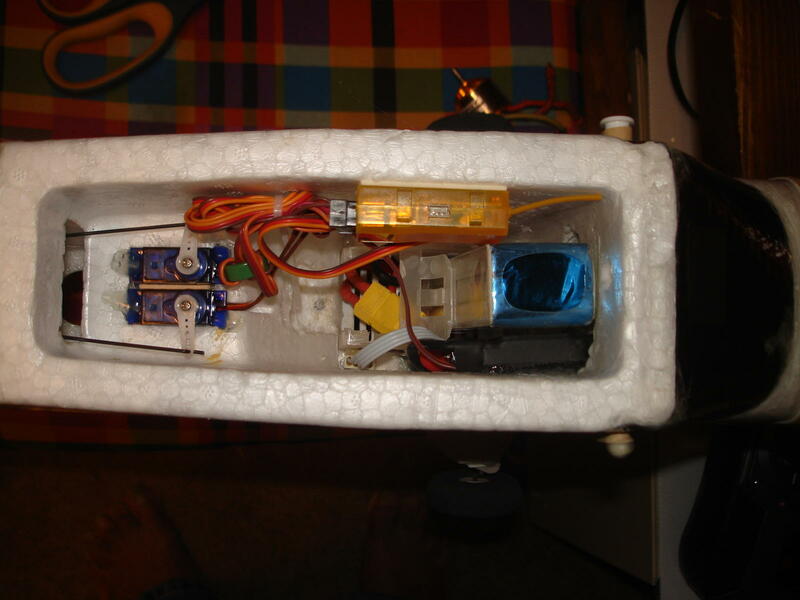 The simplest way to do it is with clear packing tape. I used 2" wide tape. The trick is not to cover the whole bottom of the wing because it warps it all over. Push the wing just past flat and tape only about the middle third. Just where the stress is. Once you get it to sit flat, tape fully across both sides and you'll end up with a wing that's much stronger than stock without and weak areas from cutting and you don't have to do any other reinforcements. Then you can cut out your ailerons. I have cartwheeled many times with no recurving of the wing. Is that a fiberglass cowl on yours? I got tired of buying cowls so I made a cast of mine using plaster of paris, made a small vacuum form table and now can make my own. I was pretty proud of myself for that, but the reality is, the cowls are so cheap it isn't worth the trouble!